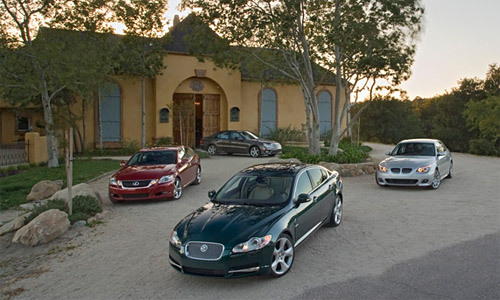 Mostly due to their similar exterior, I’ve been very curious to see how the new Jaguar XF would compare to the Lexus GS on the road, and Motor Trend has done just that, pitting the XF and GS up against the BMW 550i and the Mercedes E550. Paddle shifters? “Too bad there are none as in the Jag and Benz,” observes Reynolds, while Mortara takes it one step further: “Paddles would transform this car,” adding, “as would 19-inch wheels with more aggressive tires.” Unfortunately, our GS has come with 18s wearing run-flats, stiff shoes that do little to offset the already firm suspension. Our connoisseurs judge its interior as the most user-friendly, its back seat the most comfortable for two, and its EPA fuel economy and as-tested price the most appealing. With the votes in, though, the Lexus is akin to bringing sake to a cabernet competition. Sure, it’s technically wine, but it doesn’t really match up, lacking the requisite flavor, color, and vivacity to stir the judges. Even with the fourth place finish, it seems that the GS excelled in Lexus’ usual areas, with the interior, fuel economy and price being the best of test. Still, it’s about time for a redesign of the GS, though I think the introduction of a GS-F might significantly push Lexus up the rankings.